31/3/09 – Discovery – Reims, Musée-Hôtel Le Vergeur - The catalogue for the Maastricht Fine Arts Fair this year opened with an introductory essay by Peter van den Brink, director of the Suermondt-Ludwig-Museum in Aix-la-Chapelle devoted to the Dutch painter Jacob Adriaensz Backer. This museum is currently offering a retrospective on the artist. In it, he publishes a very important painting held in a French museum which had remained totally unknown until today. 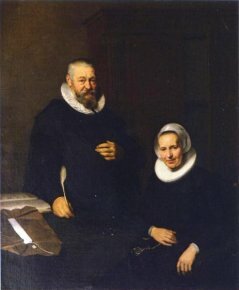 The work is a Double Portrait of a 62-year Old Silk Merchant and his Wife, of imposing size, in excellent condition and of superb quality (ill.). The Musée-Hôtel Le Vergeur in Reims is not familiar to the general public. Located in an old townhouse (largely reconstructed after World War I), it belongs to the Société des Amis du Vieux Reims and presents essentially furniture and art objects, some Albrecht Dürer engravings (The Apocalypse and The Great Passion), portraits of famous figures in Reims, sculpted elements from destroyed houses and documents on the coronations of French kings. Backer was considered a student of Rembrandt for a long time, whereas he in fact worked under Lambert Jacobsz. He was only two or three years younger than Rembradt and was more of a competitor than a follower. His portraits were influenced more by Flemish painting, notably Van Dyck. Such a discovery is really equivalent to an actual acquisition. In France, the Musée Granet in Aix-en-Provence, as well as those in Lyon and Tours own portraits by this artist who worked in Amsterdam. The museum in Rouen holds a series of four evangelists by his master, Lambert Jacobsz, close to Backer’s art.